Cherrapeno: Chocolate Covered Ritz Crackers for Nutella Day! Yay! 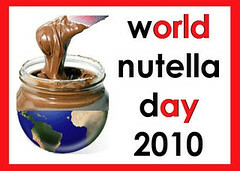 Today is "World Nutella Day 2010" - a day to celebrate, get creative with, and most importantly, EAT Nutella! Being in love with the salty/sweet taste sensation, these crackers are totally awesome! I've seen them with peanut butter, and one of my favourite things to eat is Nutella spread onto Ritz crackers. So why not have both - and then cover it in white chocolate. I don't need to say anymore! Just make as many as you want! 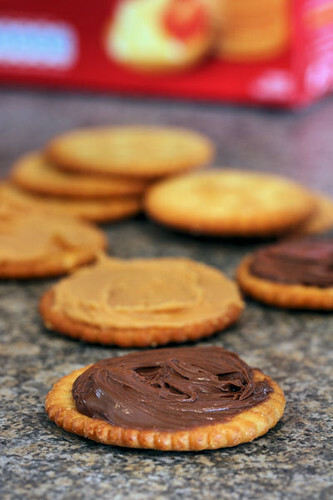 Spread half the crackers with Nutella, and half with peanut butter. Put the halves together and put in the fridge to set a little while you melt the chocolate. Melt the chocolate in a double saucepan or the microwave, dip the filled crackers into the chocolate and turn them over to coat them properly. Lift out of the chocolate with a fork and lay them on some baking parchment. Put them into the fridge to set. If you love Nutella as much as I do, then hop over to the World Nutella Day website and have a look at the ever-growing list of Nutella recipes. Sara from Ms. Adventures in Italy and Michelle from Bleeding Espresso will be posting a round-up of Nutella recipes, photos and everything Nutella on Monday 8th February 2010. Happy Nutella Day Nic.Very inventive, like a salty version of an upscale Reece's Peanut Butter Cup. Your sweet tweat would go very well with the semifreddo I made. What a creative creation this is!! They look awesome & so georgous & tasty too! is it really? how funny - it's my birthday today and everyone says I'm a bit nutty! your treats look delicious and I love salt/sugar combinations. This is a more glamourous option than taking a bite of choc and a handful of crisps in the same mouthful! 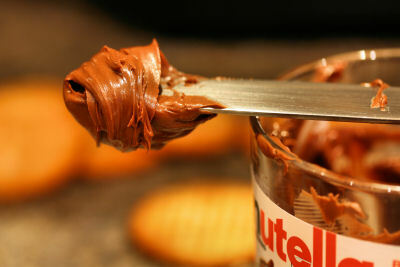 World Nutella Day? This sounds really cool! I want some of these special crackers u made! That's very creative....somple and delicious! I will have to make these. Thanks for sharing. I think you may have just started a new trend here Nic! Such a great idea and they look wonderful. that's a mighty tasty combination, nic! buttery ritz crackers are a favorite snack for me and if i'm ranking my top 5 dessert ingredients, peanut butter, white chocolate, and nutella are there. awesome. I didn't know what to expect when I clicked on this recipe - pleasantly suprised!! Celebration in a cracker!! Sweet and savouty is how I like it too, and I love the drssed up in white chcolate look! Magical Nic!! What a brilliant idea! They look fantastic! 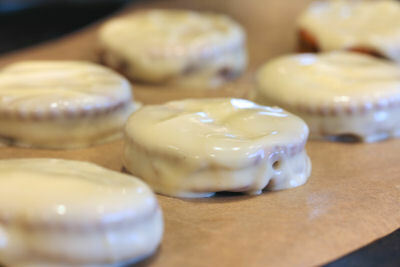 I am so making these as soon as I buy more Nutella! Will have to make a batch of the Nutella filled Ritz biscuits to make up for it! I made these same exact cookies a few weeks ago. I gave them to my friend as a gift - she LOVED them. To make them even more special, I sprinkled chopped walnuts onto the white chocolate while it was still hot so they'd stick. They look scrummy Nic...only you could make the humble Ritz cracker look that good! I think I'm in love... I have always been a fan of sweet/savoury combos since I was a kid, so this sounds like a piece of heaven to me. Love sweet and salty. Love this. Thanks so much for participating! 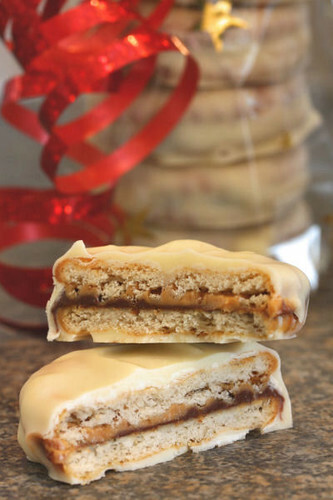 A very great variation on my usual peanut butter filled butterscotch covered version. The sweet/salty combo is so tasty and I am always amazed at how easy these are to make! Just made these as Christmas gifts for friends. DELICIOUS! Made one batch with just Nutella, covered in white chocolate and sprinkled with candy cane crumbs, and the second batch with Nutella and pb, covered in milk chocolate with chocolate sprinkles. 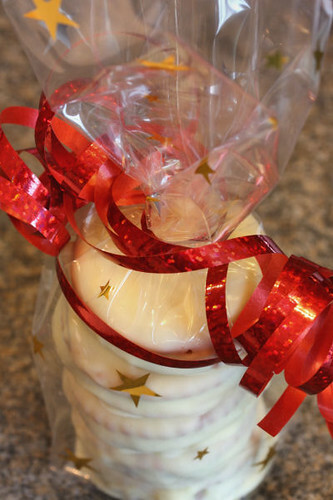 Super easy - could make in my dorm room - and everyone loved them!! Thanks for the recipe!